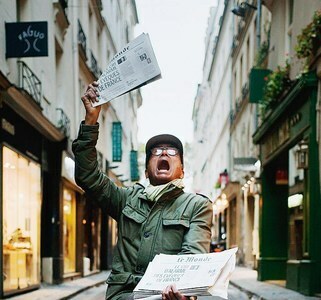 A newspaper hawker yelling at the top of his voice the day’s headlines in the streets of Latin Quarter of Paris is as much an anomaly in the present epoch as, say a horse-driven carriage. Undaunted by the changes of time, Ali Akbar sets aside his old bicycle every day, seven days a week, exactly at 1pm at the same spot of boulevard St Germain as he has done for the past more than forty years. Slim and dynamic at age sixty-four, Ali says the nostalgic memories are very much alive of the times when he sold hundreds of copies of dailies like Le Monde and Libération, in addition to weeklies Charlie Hebdo or Journal du Dimanche. People sitting in legendary cafés like Lipp, Flore or Deux Magots frequented in ancient times by intellectuals such as Verlaine, Rimbaud and Mallarmé and later by Jean-Paul Sartre and Simone de Beauvoir laugh at Ali’s jokes and readily buy his papers even if they don’t need them. He is also the author of a book Je fais rire le monde mais le monde me fait pleurer (I make the world laugh, but the world makes me cry), an autobiographical work recounting his poor family background in Rawalpindi and his survival struggles in Paris. A real star of Latin Quarter in his own way, Ali is frequently invited by well known politicians, often by movie celebrities like Sophie Marceau to have a cup of coffee with them. Ali who speaks in fluent, accent-less French says the publication of his book has brought in a certain change to his family life as well. His five sons between ages twenty-three and ten used to be a bit embarrassed by the fact of his being a newspaper hawker. Last December, shock fell on our hero when he was told by the newspapers he sells that his services were no longer required. Prominent Latin Quarter personalities reacted enthusiastically to this and, backed by a number of professors at the Science Po university situated in the area, a petition was circulated insisting on the presence of Ali not just as a hawker but also as an inseparable part of the Parisian culture. It gathered more than seven thousand signatures and he was eventually requested to continue. This entry was posted on Tuesday, June 19th, 2018 at 00:01	and is filed under Uncategorized. You can follow any responses to this entry through the RSS 2.0 feed. Both comments and pings are currently closed.